The female characters prepare a similar ambush. Hero sends Margaret to fetch Beatrice, instructing her to say that she has overheard Hero and Ursula gossiping about her. Hero remarks that “Cupid’s crafty arrow… only wounds by hearsay.” (3.1.22-23) As soon as they notice Beatrice sneak up on them, Hero and Ursula begin an argument about Benedick’s supposed love for Beatrice—should he tell her about it? Hero argues that he should keep it to himself, because Beatrice’s wit, pride, and fault-finding make her incapable of love. Hero especially criticizes Beatrice’s tendency to ignore every man’s good qualities by “spell[ing] him backward.” (3.1.63) She also worries that Beatrice would mock him to death: “[to] die with mocks… is as bad as die with tickling.” (3.1.79-80) Ursula suggests that it would show bad judgment on Beatrice’s part to reject Benedick, the best man in Italy. Like Benedick, Beatrice falls for the trap. When the two other women have left, she decides that she must marry Benedick after all. Hero’s saying about hearsay applies not only to the loves in the play, but to everything else as well. Each character’s view of the situation is influenced more by what they have heard from others than what they have experienced for themselves. This allows for a great amount of irony, in the sense that the audience always knows something that a certain character does not. Hero compares Beatrice’s disdainful perspective on men to spelling backward. This direct comparison of judgment to writing emphasizes the importance of language to the perception of reality in the play. Hero’s worry that Beatrice will mock Benedick to death echoes one of the play’s central themes—love comes with a great risk of shame—and actually predicts her own future, as the shaming she receives from Claudio on her wedding day causes her own "death." Lucas, Julian. "Much Ado About Nothing Act 3, Scene 1." LitCharts. LitCharts LLC, 16 Sep 2013. Web. 26 Feb 2019. Lucas, Julian. "Much Ado About Nothing Act 3, Scene 1." LitCharts LLC, September 16, 2013. 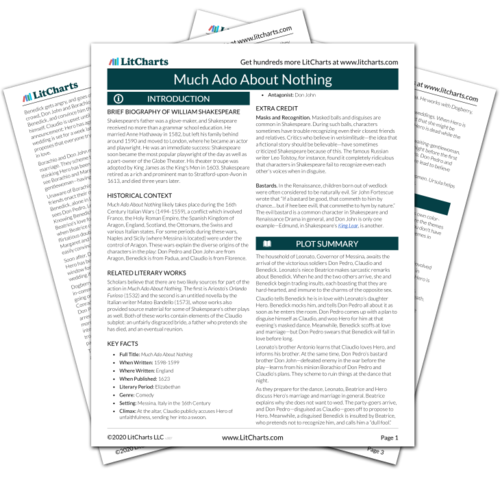 Retrieved February 26, 2019. https://www.litcharts.com/lit/much-ado-about-nothing/act-3-scene-1.